BlackBerry has a pretty decent market share. When was the last time you heard that sentence? If you're talking about smartphone competition, it's been a while. In the world of in-vehicle operating systems, however, a new story is beginning to unfold. 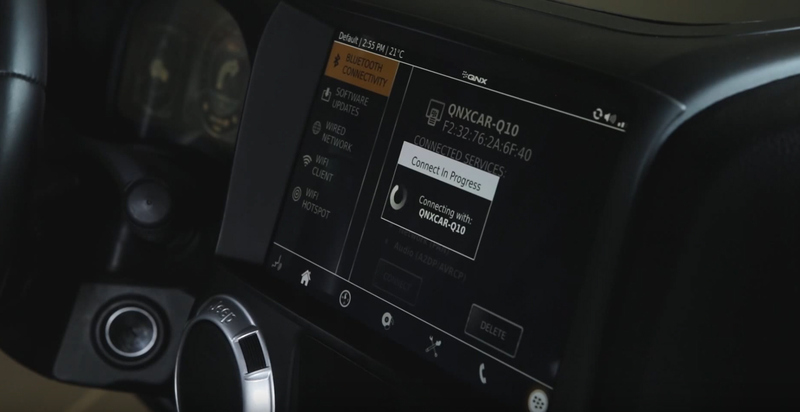 As with its phone business, BlackBerry has a storied history with in-car telematics, with a footprint dating back more than 20 years. Its most relevant current presence, though, goes back to 2010. That's when BlackBerry (then known by the now-defunct parent company name Research in Motion) acquired the Unix-based embedded operating system QNX. You may recall 2010 as a time when Apple's braggadocious attempt to reinvent the smartphone was paying off in ways few people had predicted, not only shoving BlackBerry off its once-impenetrable pedestal, but also inspiring Google to join in the disruption and do even more damage. Desperate, BlackBerry used its newly acquired software platform as a catalyst to reinvent itself, launching a new tablet, the Playbook, and a redesigned BlackBerry phone: both with enormous marketing budgets behind them. It was too little, too late in a market that was already overwhelmingly content with iOS and Android. Both of those new mobile products fizzled away in merciless fashion, but in a much less publicized effort, BlackBerry also took QNX to auto makers, and over time began building an impressive presence under the hood of modern cars. Today, QNX powers the onboard operations of some 60 million vehicles. It overtook Microsoft's dated Microsoft Auto platform as Ford's system of choice in 2014. It's a pretty solid and powerful market. And that's why Google now wants to try to take over. At its developer conference, I/O, Google introduced Android Automotive: a full-fledged vehicle operating system. Many car tech enthusiasts may be familiar with Android Auto, which is the mobile platform's first foray into the connected car space, but that is essentially just repackaging the mobile phone experience with the appropriate display size and power source needed to run inside a vehicle. Android Automotive, on the other hand, is the entire brains of the vehicle: managing climate control, locks, windows, etc. BlackBerry has a frustrating history of building something, proving its value, becoming very well respected in corporate circles, and then sitting back, resting on the laurels of all that hard work. That's the business model everyone had a couple decades ago. It was a pretty sweet time to work in the technology space. It doesn't work anymore. Android Automotive will be a living, breathing smart car platform. It will be doling out firmware updates and user-created apps and content, while consumers driving what were once state-of-the-art vehicles just a few years earlier, will be stuck looking at the same interface they've had from day one. Android Automotive already boasts partnerships with Volvo and Audi, and if that's not enough pressure to put on BlackBerry, Apple -- which once touted its CarPlay platform as a companion to QNX -- is no doubt poised to enter this battle as well. When Apple and Google enter a market currently dominated by BlackBerry, the rest of the story seems ready to write itself. It's now or never for the previously venerated software company to do something bold, something risky, if it wants to maintain relevance in this space. A good start is the BlackBerry QNX Autonomous Vehicle Innovation Centre, which opened six months ago in Canada. Regardless of what happens, the next couple years are going to bring so many paradigm shifts in the way software and vehicles interact with one another, that it's hard to predict what will happen.